This blog entry will inform members of the Selective Support group on important issues related to the 2020 Selective Test and scholarship tests to take the heavy load away of the internal message board. I checked with UNSW Global and they say that if schools don't offer ICAS, the only way is to go to North Shore. As North Shore offers REACH first and only top 10% will be invited to do ICAS, it's bad but it's the only choice. Many schools don't want to offer ICAS as they do not have decent computers and network to handle online ICAS. So, a lot of students will miss out of ICAS test. ICAS is only of good value to those wishing to apply for scholarships at private schools. Otherwise just buy the past papers and do them at home to get some idea of performance. ICAS will be a problem this year. Schools don't know what to do as EAA's old ICAS has been replaced by their new program called REACH which is more or less a NAPLAN level test for various subjects. Their new ICAS is now for high performers. ICAS also goes online and cramped into 1 week. Many schools don't know what to do and may not offer ICAS at all. Some cut the participation down to only English and Maths. This is a problem for our students because the high performers would want to do scholarship tests. They want ICAS results to be in the portfolio to support the scholarship application. In this case, parents may need to use North Shore Coaching who is a partner of EAA to participate in REACH. North Shore wants kids to do REACH first then top 10% will be invited to do ICAS. Parents should check if they will allow kids to do ICAS without doing REACH and getting into the top 10% first. The attention is now being turned to 2020 selective test. A glimpse of the success of 2019 selective group has so far been seen by the number of scholarship offers from private schools. It is at 18 and expected to rise a bit more. This means, we will beat last year's record of 18 scholarships. Year 5 students will follow the same path to Oct 2019 where some will sit a number of early private scholarships on offer. The schools expected to offer early scholarships are: Pymble LC, Abbotsleigh, Danebank and Barker College. Only Barker College is available to boys. All the others are for girls. This means strong performers and those wishing to do scholarship tests should be on the fast pace. By Aug, these students would already do some year 7 work and try 2 selective trials by Sept and early Oct. There is a document to guide students wishing to do early scholarship test. Top students who may not wish to do any of these early scholarship tests would still want to work at this pace. A lot of students are not among the top performers. They need more time. So, they might only finish OC revision by Sept and get on year 6 and 7 level late. They will have to work harder during Sep - Dec and work very hard in Jan-Feb 2020 to be ready for scholarship tests and the selective test. The NAPLAN test is important even though it is easy. NAPLAN 2019 will be in May. Even though, NAPLAN is known to be easy, we have a few issues to consider. It is an online test. And writing online is not easy if students are slow in typing. The other issue is that students often score poorly in writing. This can affect the school report and also affect the English marks going into the selective school application. Students must prepare for NAPLAN writing by working on both narrative and persuasive writing even though only one type will be tested in the NAPLAN. No one knows which type it will be for the year! ICAS can be important. It is certainly important for scholarship applications. This year, EEA has changed ICAS. They offer two programs called REACH and ICAS. ICAS is now for high performers while REACH is for all students. Perhaps, they hope to get more low performers doing their tests. The trouble is that ICAS is now cramped into 1 week in Sept. It is also changed into online test including writing (only year 3-4 are exempted from online writing). Students will need to type fast enough. The preparation will be very cramped in a critical time where a lot of school work will be going on to collect marks for the selective school application. This blog entry will inform members of the Selective Support group on important issues related to the 2019 Selective Test and scholarship tests to take the heavy load away of the internal message board. Now is the time to rest for the selective test. Students need to be fresh on the day to well. It's important to call it the end and rest. Students should avoid risky things such as eating out and exposure to sudden change in weather or playing tough sports just before the selective test. 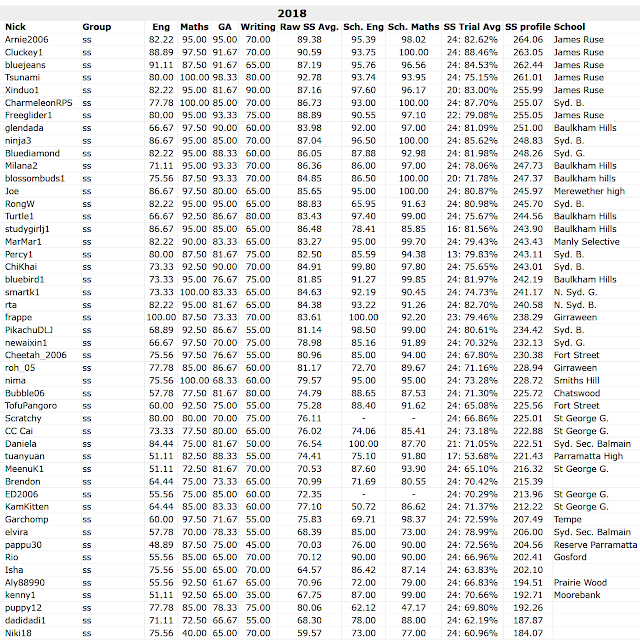 Here is the ranking against last year's students based on the last 3 trial sets (trials 6-8). 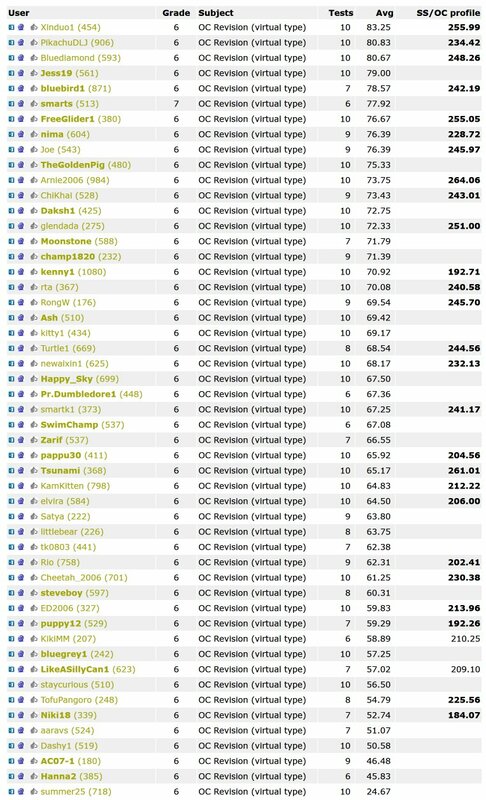 This ranking is probably more accurate than the ranking across all 8 trial tests (since Oct 2018) when it comes to predicting the performance in the selective test. Several students are not in this list as they have not finished the last trial. There seems to be a lot of hesitation from students this year to complete all 8 trials. - 4 scholarships during Oct-Nov 2018 scholarship tests with 2 full scholarships to Ravenswood and Dane bank and 2 part scholarships to Pymble LC. Many other private schools have not started calling for interviews. In the next 2-3 weeks, we will know about those already interviewed and hopefully more interviews will be offered. Not all students are high performers so some parents wonder what to do if they get offers from low selective schools that they don't really want to attend? There are some Catholic schools that offer the Newman program. It's a gifted program that the Catholic schools have been running in a fashion similar to part-selective schools. The difference is in enrolment. The students must be enrolled at a school that has the Newman program before being allowed to sit the test to enter the Newman class. The test is later around July-Aug each year. Students who can achieve placement into a part selective pubic school will certainly get a place in this Newman program. Here is the list of Catholic schools offering the Newman program. There is an article on SMH about scholarship tests. This one has an interview with AAS managing director. The AAS scholarship test has been growing in popularity across Sydney's private schools. AAS marks the tests quickly. Each test is separate for each school and allows each school to set a different date for its test. The format is also closer to the NSW selective school test. The ACER test is quite different with heavy emphasis on English with 2 writing tasks and without a "general ability" component. Most schools that use ACER test tend to use the ACER co-op test which is shared by all schools on the same date. Even though it is supposed to be convenient for students to do just 1 test while applying to many schools, the reality is a cheat. ACER forces parents to rank the school choices so only the 1st choice school will consider the application while all of them take the monies! It's extremely rare for a school ranked lower to even contact the parents to offer an interview. They just have too many good applicants to care about doing what is fair to parents and students. Our students are getting ready for the first few scholarship tests in Feb. This year, several top schools are offering AAS tests early. This brings the effort forward for the top students who intend to try their best to win. This is good because if the weaker schools offer first, parents have to pay to keep them then later lose the monies when they turn down these offers to accept offers from higher ranked schools. In the past, curiously, many top schools tend to delay their tests to the middle of later part of the Feb-Mar scholarship seasons. All past students said that the OC Revision series of 10 tests was harder than selective trials. This is because this series has the hardest questions that most students at OC level failed. It is highly recommended that all year 6 students should complete these 10 tests and learn to solve the failed questions. The following table shows how this series related to real selective profiles during the past 2 years. Now is the time to apply for private school scholarships. The following list shows most of the scholarship tests available in Sydney, New Castle and The Illawarra. It's important to check the school website for info such as what types of scholarships are on offer, if a report is offered about test performance and how far the school is from home. Students who average close to 80% on selective trials are capable of getting scholarship interviews. Other students might do scholarship tests for the purpose of getting experience (as selective trials). Lower performers might like to apply to schools of lower ranking to avoid competition from high performers. Students should have done 6 selective trials and a variety of other tests before the 1st scholarship test. The NSW Department of education has conducted a review of its G&T programs. The report is published on its website. I have read the entire report and feel relieved that the review was conducted by independent experts from Melbourne, Adelaide and a university in the USA. They propose many actions but only a few are note-worthy as they might affect students in a significant way. - They did not review the scaling/moderation process for school marks and test marks at all. This is where the marks could be "doctored" to achieve a political or social engineering purpose. They did not want to expose this out to the independent experts. - They want to review the school marks and make them more consistent across schools. But it is only proposed. Nothing is expected to happen soon because they have to work with many parties and the problem of non-government schools not providing school marks. They can only make public schools provide more consistent marks according to a well-defined standard. This can only be good for all students in public schools. - They want to redesign the OC and Selective school tests so that they will be more tuned to "ability" rather than performance. This is an area where we have endless debates. So, they propose that students of higher ability should be given harder questions in an adaptive test (probably run by computers) much like the online NAPLAN. This is something they haven't even sorted out in NAPLAN. Until they can make sure that all test centres can provide computers and there is enough debating on this adaptive model, they won't do it. It's expensive and subjected to too many criticisms. - They want to fight the tutoring business by making the test more unpredictable. However, they also want students who don't get tutoring to find the test less unfamiliar. How on Earth is this possible? They even suggest that schools should help students to become familiar with the test. They also propose to use adaptive test run by computers to create this unpredictability. They argue that the current test is weighted in favour of maths because the GA part is weighted in favour of maths. So, the overall weight of the whole test is more to maths than English. Perhaps, the marks that they have correctly shows this. But this conclusion is based on ALL applicants. It is not based solely on the successful applicants. We know that the successful applicants generally find English a lot harder than maths. The marks for English is always substantially lower than the marks for maths. So, this finding is debatable. Also, this does not touch the scaling process that favours English. Moreover, a lot of students just go into the selective test and guess the questions. They shouldn't be there at the first place. They should have based this conclusion only on the marks of the successful applicants. It's been a long debate over ability vs. performance. High performance cannot be achieved without ability. Yet, many still claim that ability alone should qualify students into selective schools. The truth is clearly that only those with high ability and also work hard can get high performance. If they actually succeed in producing tests that favour students of higher ability against the hard-working students who rely on easier questions and familiarity with question types, it will be great! This will favour Mathemafix's users as we have lots of students who want to study less, play more and deal with harder stuff. It's silly how they go about this. It's nothing new as the way to identify students of higher ability has been around for hundreds of years. All they need to do is to give more marks to the harder questions. This is what Sydney Grammar do in their scholarship test. It has always been a feature in the past and currently used in high school, HSC and at universities. This feature might be in the "improved" selective test for 2019! There is no need for an adaptive computer-generated test based on how many questions a student has got so far during taking a test. I think the whole thing is just a set of proposals. Nothing of significance will happen in the next 3 years apart from cosmetic things like better communication to schools and parents and marketing campaign targeting small minority groups. They will ask schools to provide more information to students and parents and even provide some help to students level the playing field between those who have tutoring and those who don't. But the schools will be the ones who actually decide if they want to do anything at all. Congrats to Moonstone on 100% scholarship offer. The reports from Danebank and Pymble LC are now out. 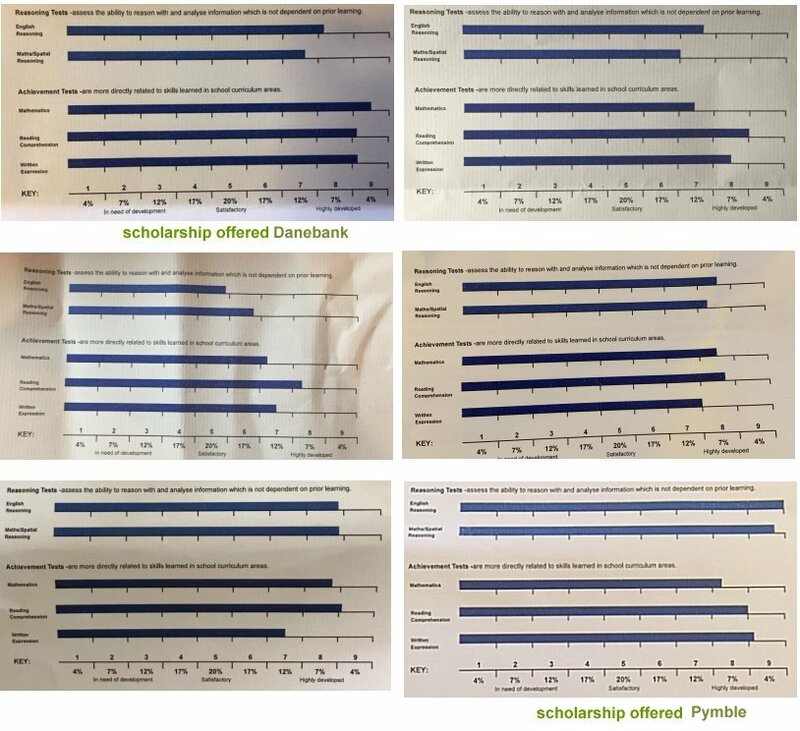 There is 1 full scholarship offer from Danebank and 2 x 25% offers from Pymble. I now have some ideas. Danebank is easier to get scholarships as the competition is not as tough on the SW side of Sydney. Pymble is just very hard to get an offer. We now have 4 scholarships with 2 of them are full scholarships: 100% Ravenswood, 100% Danebank, 2 x 25% Pymble. It looks like this is the battle of true Mathemafix believers vs. non-believers. So far, 2 kids who followed the early scholarship work plan and worked hard got scholarship offers. One kid joined Mathemafix late and only got a few 1-on-1 writing lessons to try to bridge the writing gap managed to get an offer. The kid already had excellent performance in other areas. The others did not get invitation to interviews (including some who relied on tutoring class work and trials). What looks so interesting is the quality of writing expected in scholarship tests. They set it very low compared to what we, at Mathemafix, expect the kids to be at. It is funny to see that one of our weakest writers got into band 9! But it also shows that we have students who know they are weak in some areas and made a real effort to improve. It all goes back to self-learning, independent thinking, parental support and diligence. On page QUICK LINKS, there are now plenty of sheets supporting narrative writing and the comprehensive writing guide. The are writing modules in More ... and the Collaborative Writing Forum. Students have all the support they ever need to do well if they want to put in a real effort. Writing does not worth much in the selective test but it is really important in scholarship tests just because it is the area where most kids are weak. Congrats to ksb17ss on a part scholarship offer. It's just a confirmation of current performance and an interview experience. This will lead to excellent opportunities in the main season of scholarship tests between Feb-Mar 2019. Writing is the hardest area and it is where one would want to do well to gain interview opportunities. I attended the Syd Grammar presentation on scholarship. The following points are in their presentation. - Up to 25 scholarships (all types) but they have never awarded 25 scholarships in the past and don't have the intention to award that many. All scholarships are 100%. - Syd Grammar is "marketing" their relatively new program called "fee-assisted" places where students of lower ability than the scholarship winners can get a discount depending on the income of parents. - I think they want to push the message that they push the students very hard in academic front. But they provide a huge amount of support to students and help the students to cope and do well. However, they expect students to work very hard. This is what they want to differentiate against public selective schools where the public selective schools also push the students very hard, but expect students to get outside help and tutoring to keep up. - Syd Grammar seems to suggest that they want to market fee-assisted places to get access to more high quality students with good values rather than using 100% scholarship offers to get more top quality students. They want money become less of the issue for high quality students who want to study at Syd Grammar. Frankly, this sounds like a different way of offering small scholarships. - The scholarship (and fee-assisted) process has 3 steps: test, group activity for observation, interview. - There are 3 music scholarships. Applicants are highly recommended to sit the scholarship test. If they don't sit this one, they will have to sit the entrance test in May anyway. Successful music scholarship applicants, by sitting the scholarship test, they may not have to sit the May entrance test. If they don't do well in the scholarship test, they can sit the entrance test again. - The scholarship is written and marked by Syd Grammar teachers. As they do not use multiple choice, students who don't have good spelling, good sentence structure and grammar, ability to find the answers and write succinctly and also the ability to write creatively in the narrative task are not the type of students they look for. Basically, boys who want to apply for Syd Grammar scholarship should be able to come up with answers without looking at the multiple choices and write the answers down in clear and error free sentences. They also need to be able to write good narratives. This is old school scholar type who can think deep and write well. While this type of students will always do well in the selective test, most students who do well in the selective test won't do well in this type of old fashioned tests. It looks like some schools have moved their dates to early Feb to make it harder for parents to "run away". Once a scholarship interview is finished and a scholarship is offered, parents only get a few days to pay the enrolment fees and get locked in. Parents should identify their favourite school's test date, and then enrol the kids to do a couple of scholarship tests at other schools before this date. This will prepare the students better for the most important test. All students heading to scholarship tests should aim to finish at least 6 selective trial sets, plenty of selective boosters and complete 75% of the entire selective program before the 1st scholarship test. High performers generally finish 80%-85% of the selective program around 1 week before the selective school test at the middle of Mar. Around Christmas, we would have a number of results back from early scholarship tests. I will provide an analysis of the picture so parents know what to expect going into the main scholarship season of Feb-Mar 2019. * It is possible to go directly to ACER to ask for the result. School marks for selective application continue to be a big headache for parents. Big problems tend to happen to 10% of students due to several factors: mistakes at the school, inconsistent procedure for collecting marks across different teachers, personal prejudice from a teacher on what kind of marks to collect for English, inconsistencies across school report and marks for selective application. The ongoing appeals and arguments between parents and the schools and the SSU have reveal all these terrible problems that started at the schools and continue to the SSU. Appeal is almost NEVER successful. Even when it is successful, the students will only be offered places on the reserve list of the lowest choice of schools. They only ever get the left-over crumbs on the table! So, the message is "Make sure the school has a fair procedure in awarding marks and make sure that you see the teacher 2-3 times from term 1 to middle of term 3 in year 5 to detect if the school marks will be good or bad". If the school marks are likely to be bad, move the kids out of public school into Catholic schools to avoid school marks altogether. - Each teacher will give marks from his/her own view points. And the marks going into school reports can be very different from marks going into the selective application! - The school may collect all English works and get one teacher to remark them all to get marks for the selective application. - The school may set tests to collect marks for selective school application. - The school may use ICAS and/or NAPLAN as a part of the marks to go into the selective school application. - Some teachers may not even follow the procedure of the school for getting the marks. - Some teachers may not care at all and move on to another school as their part time jobs at the school anyway finish after year 5. You can only trust the school if it has a printed and published procedure for collecting marks using mainly tests rather than letting teachers do whatever they like. So, it's important to ask the school for a printed copy or email of the procedure. If they do not have it, don't trust them. The solution is to book appointment to meet with the class teacher 2-3 times between term 1 to term 3. Discuss about the performance of the kid and ask what the marks for selective application will be like. What could be wrong in dealing with the appeal after the selective result is out? The best thing is to avoid having to appeal! Appeal is almost never successful and only ever result in getting the left-over crumbs if it is successful. - Schools may deny the problem and claim something went wrong with the SSU computer database. They will resubmit the marks and allow the appeal to go ahead. - Schools may claim that writing quality is poor and show evidence without showing how the work is compared to those of other students. The marks are all subjective! They would refuse to support the appeal. - The school may support the appeal with the wrong reason and the SSU will throw the appeal out! This puts the onus on parents to be 100% sure about the reason for appeal (don't expect the principal to be correct about this). - It's very important to know that the SSU does not care what happens at the school! They only send the application to the panel when the reason for appeal is valid. Parents must make sure they chase the schools for evidence of incorrect marks. And the schools will try as hard as they can to deny that they made a mistake. So, it's vital to push the school so hard that they have to reveal the works. Parents must see the works and agree that the works are poor and the marks were fair. Otherwise be prepare to threaten to sue the school for failing to properly assess students. Congrats to ksb17ss on getting an interview offer at an early scholarship test. It looks like kids who score around 250-260 in OC test are leading the charge in getting interviews at early scholarship tests. However, by Feb-Mar, they do even out after completing most of the Mathemafix selective program. By this time, even kids with OC profile around 225 could do well in scholarship tests and get interview offers. Now is the time for all year 5 kids to start looking at the Selective Minimum Work Plan 2019 to make sure enough of the important work get done. Only the weakest students would continue doing year 4-5 work at OC level for another few weeks (until end of Dec) and then they have to get on this minimum work plan to get enough exposure to selective level questions. I plan to run a mock trial on Sat 13th. This allows parents to see their kids' performance against last year student around the same time and see what selective profiles these past students got in 2018. This is also part of the preparation for early scholarship in Oct-Nov. Many students are not working on the Early Scholarship Tracking plan, do 2 online selective trials and get ready for early scholarship tests. 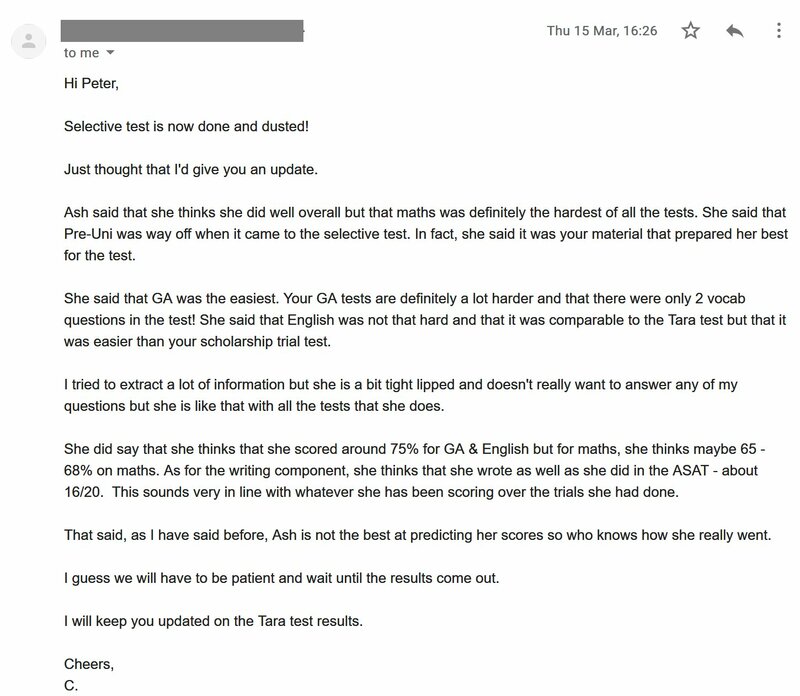 Some parents have asked me about their kids' results from the PreUni ASAT mock selective test. This test has always been a headache for many parents because they are new to game and have no idea what a mock selective trial in Sep really means. The PreUni ASAT is also a test that is designed to scare parents and hope parents will enrol their kids to do the weekly PreUni trial tests. So, they tweak the test to terrify the parents as much as possible. While, all tutoring places would do this, PreUni is the one that has gone too far in this direction. There are so many reasons why kids don't do well in this test in Sept. To name a few, here is the list of issues. - The kids are not ready. They have not done enough work and not at the level of a selective school test because this test is 7 months away from the real selective test. - A lot of kids who do weekly trials at tutoring colleges have seen the kinds of questions at selective level do they score better and get higher ranking. - Many students at PreUni are in this test, and they have been given similar questions to the ones in the ASAT test. So, they rank higher than kids who do not attend PreUni weekly trials. - The test is design to scare parents and get them to enrol kids into PreUni weekly trials. Therefore, ridiculous questions are added to make sure kids don't score well. If your child has nearly completed the early scholarship plan on Mathemafix with good scores, the story will be completely different. It is likely that your child will be within the top 150 students at this ASAT test. However, the main idea at Mathemafix, is that students work at their own level and try to score over 85% at all times to build the foundation for highest performance in Feb-Mar 2019. They aim to be ready when it's time to do the real things such as scholarship tests and the selective test. What does it mean if your child got a rank 800th or even worse in PreUni ASAT test? It only means your child is likely to score under 220 in the real selective test. And your child will have a small chance of getting into one of the top 10 selective schools. It's not unusual for kids on Mathemafix who are ranked around 500th in the Sept ASAT to move to top 150 in the Jan ASAT and got a place in one of the top 7 selective schools. So, if your child gets a poor result from the Sept ASAT, don't be scared and enrol your child in PreUni weekly trials. This is what they want you to do! It's a waste of time and will give more stress to your child. It's better to get on with the early scholarship work plan and sit an early scholarship test to get a more realistic result from Pymble LC or Danebank. Here is a comment from a parent about the PreUni mock test. Her child got a terrible rank. Later, the kid got 225 in the 2018 selective test (around 40 points higher than what PreUni predicted). It's bit too early to talk about scholarship results. However, Ravenswood moved their scholarship test from Feb of year 6 to Aug of year 5 just for this year for some unknown reason. Congrats to SuperVJ on a full scholarship offer on this very early scholarship test. This is the 1st offer considered as 2019 scholarship season. It's unfortunate that The Scots College has moved their scholarship test to Feb-Mar 2019, so the boys only Barker College test. But Barker will not provide a report. The girls still have Danebank and Pymble LC tests which will reports. I plan to offer a mock paper trial to help students going to the early scholarships during Oct-Nov. The detail is on page QUICK LINKS: Scholarship-Selective Paper Mock Test on 13th Oct 2018. Please read the document and let me know if you like to take part in it. Use the contact form or email me (mathemafix@gmail.com) to reserve a place. Students should now be doing the work in the document Early Scholarship Prep Tracking for year 5 Aug-Oct to get the right types of work to get ready for early scholarship tests. There are a few students from WA and Victoria on Mathemafix preparing for gifted & talented tests in their states. A document has been created to summarise information about the G&T Programs Around Australia is now available for download. Between 2017-2018, a student from WA prepared on Mathemafix over 12 months and score over 240 in WA GATE test, got a place in the 1st ranked school, Perth Modern. She also won a scholarship at a private school. Her ranking on Mathemafix was about the level of students who secure placements into the 5th rank selective school. In 2018, one student prepared for 12 weeks on Mathemafix and sat the SEAL test in Victoria and got placement. It was not a top ranked school. It looks like Mathemafix's selective program is quite universal. It helps students to deal with G&T tests across Australia. There are a lot of private school scholarship tests coming up for students in Victoria mainly from EduTest and also some from ACER for Sep-Nov. The Scots College no longer offers early scholarship test. Last year, they still did the test in Nov but they moved the interviews and offers to Feb 2018. They have decided to move the whole thing to Feb 2019. This means that only Barker college is available to the boys but this school will not give a report. One would only do this test with intention to win it. Among the mock selective test, the SWAT test (19 August 2018) from Northshore is decent. PreUni ASAT test (Sunday, 9th September 2018) is probably the most popular one with the largest number of participants. However, the profile prediction from this test is very bad and this is especially for students not attending PreUni tutoring classes. Past students often claimed that the PreUni ASAT's content was far away from the real selective tests. I found out late about the scholarship at Ravenswood Girls on 18th Aug. This is one is super early and this school used to offer scholarship in Feb for year 6 students. Students who are going to this one should do some of the tests across all series in the scholarship plan and perhaps the 1st selective trial. It is not a great idea to do something this early (and try to be ready for this early one) then wait for months to get to the main scholarship season in Feb of year 6. It's good as a selective mock trial for experience. We will start early scholarship preparation from 1st Aug.
See 2017 Early Scholarship to see last year's early scholarship effort and results. Now that the 2018 selective results are out, the focus is on year 5 students heading to early scholarship tests in Sep-Nov. We will start our early scholarship campaign from first week of Aug. It is expected that strong students who are in OC classes will join this campaign. This campaign treats the early scholarship tests as "realistic selective trials". There are very few schools offering early scholarship tests. Some really strong students might try to win a scholarship if but they live close to these schools. - Students will complete 2 selective trials. Parents might like to visit the page about 2017 Early Scholarship to see last year's early scholarship effort and results. The 2018 selective results are out. The biggest issue that can be seen in 2018 selective test result is that some schools gave really bad marks to students. This caused them to lose between 10-20 points! English school marks are particularly bad. This is especially true for students who have bad spelling, poor sentence structure and virtually unable to make much sense in their writing work. This indicates that reading is not the major component in English according to these year 5 teachers. This means year 5 students must learn from the experience and try to fix the basics in spelling, grammar, sentence structure and expression. These are basic stuff before students even get around to write narrative and persuasive work. If year 5 students get writing result for NAPLAN in band 5-6, the English marks going into selective test is expected to be bad. Reading should be at the top band (band 8) and writing should at least be at band 7 before students are expected to have good English school marks around 90%. This makes parents in public schools jealous of those in Catholic schools. Now that Catholic schools don't give marks, whatever students get in the selective test will be all that goes into the selective profile, and this means there is no drag from school marks. For the same test performance, Catholic school students will get the best selective profile. - Maths is easy like previous 2 years. Strong kids here get near 100% for maths. - English is hard as usual. Writing is marked very hard so the marks are low. This all adds to better scaling for English. - GA scores look quite high. 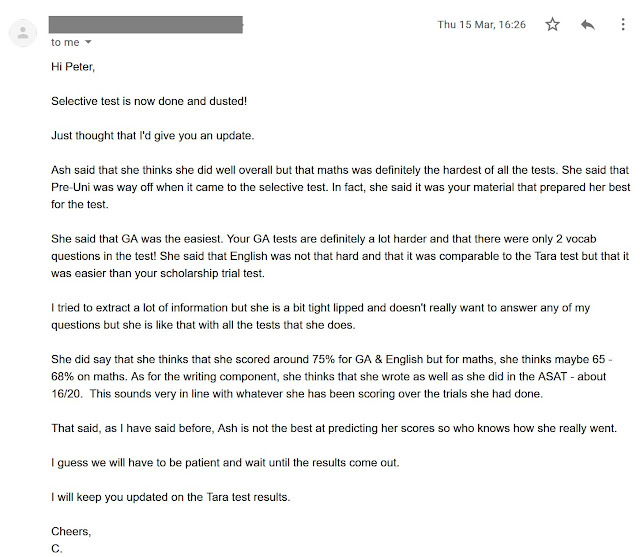 The extra set of GA questions on verbal and non-verbal reasoning really helped the students. - School maths is most unpredictable. A few students are given poor school marks and they hurt the profile. Those from catholic schools without school marks got the full benefit of high test marks without the scaling and ranking penalty which always drag the profiles down. - Some school marks for English are very bad (vs. students' comprehension ability on Mathemafix and real Eng. test marks). This indicates that these schools used writing marks for English. The SSU recommends that writing must be a part of English mark but it seems these schools use only writing marks for school Eng. marks! 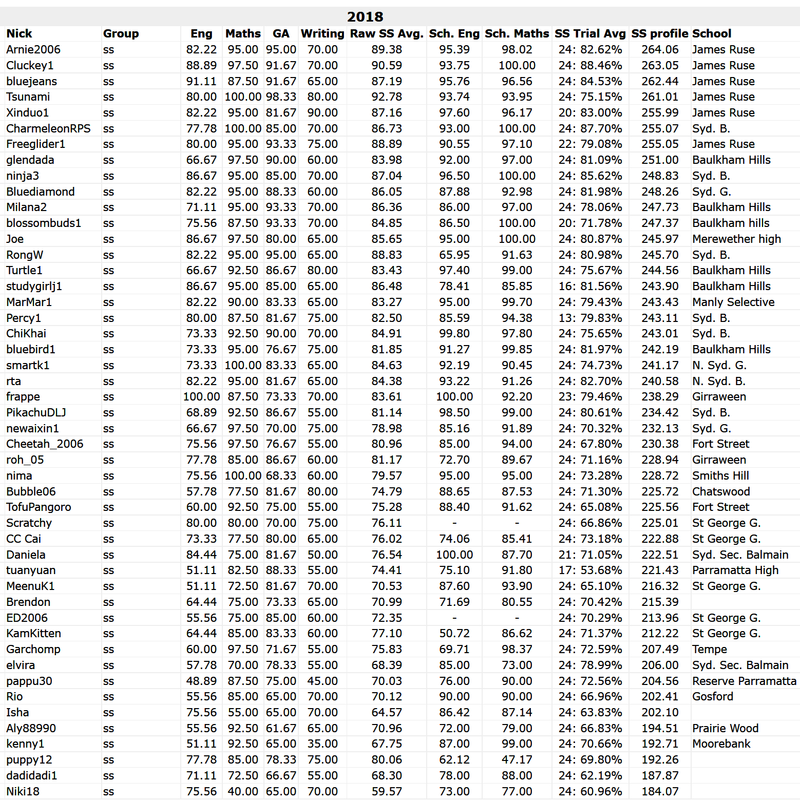 - Cutoff scores at full selective schools look a lot higher than last year. The test could have been a bit easier or there are more applicants at these schools. 2018 selective school results look excellent. The selective test might have been easy as the 1st round cutoffs at many selective schools jumped between 5-9 points. By Dec, they should settle back down but still higher than those of 2017. For students who will do ICAS competitions, just by completing the OC revision with all OC trials and boosters with averages over 85%, they are already set up to do well. For spelling, students can just write a lot and spelling will automatically improved. Paste the writing into Word for spelling check will help spelling. - Watch BTN, read transcript of texts and write summaries to improve writing and spelling too. Year 5 students will have to do the NAPLAN test soon. The NAPLAN tests are supposed to be easy. For most students here, the only component that will be a problem is the writing component. There is no way to know if students will be asked to write a narrative or a persuasive task. And this means, students must prepare for both. The writing component is also very important because it influences the school marks for English. It also reports back to students and parents/teachers how well students write. And often, the message is not very good for most students. They find it hard to get to the top band while it's so easy to get to the top band for other components. Often students in OC class will have a part of their school marks for the selective test coming from the NAPLAN and a part from the ICAS competitions (maths and English). This means students should try to do well in NAPLAN and ICAS. To prepare for NAPLAN writing, students should use the Scholarship and Selective test writing guide on page QUICK LINKS. However, this document is big and difficult. Those who just want a quick and easy shortcut can at least download the Narrative & Exposition Charts to make sure they write with correct structure for each text type. At this stage, strong students who are in Opportunity Classes (or enrichment classes in strong private schools and public schools in states other than NSW) should complete the OC Revision work ASAP. This means, they should do the OC trials and boosters. NSW students, who could score about 80%-85% average across the 8 OC trial sets will have a big chance to reach the top 10 selective schools in Sydney. After completing the OC revision stage, students can request to be moved to year 6 level to start year 6-7 work. Later, all year 5 students will be moved to year 6 by end of July. We are not about 12 months away from the 2019 selective school test. It's a good time to give parents a preview of what will happen. For most parents who have been with Mathemafix for a few months or those whose kids did OC preparation here, it's very clear how this system work. However, new parents whose kids have just joined often think Mathemafix only offers selective trials. This is quite far from the truth. Mathemafix offers complete preparation for the selective tests and scholarship tests across Australia. We now have more kids from Perth and Melbourne doing their GATE and SEAL selective programs here. We have scholarship winners from other states than NSW. The selective trials are released by a fixed schedule starting around Sep as some students will do early scholarship tests during Oct-Nov of year 5. Most selective school tests will be around middle of Feb to 1st week of May of year 6. The 8 selective trials, while very important, only serve to rank students and predict their performance in scholarship and selective tests. The other works are more important in preparing them for these real tests. If parents are only after a quick trial of the hard work, they should join Mathemafix between Oct and Jan (school year 5-6). This period is when all the hardest test series are available for students to get ready for scholarship and selective school tests. These documents provide all the pointers to how the program works and what parents could do to support their kids at home. 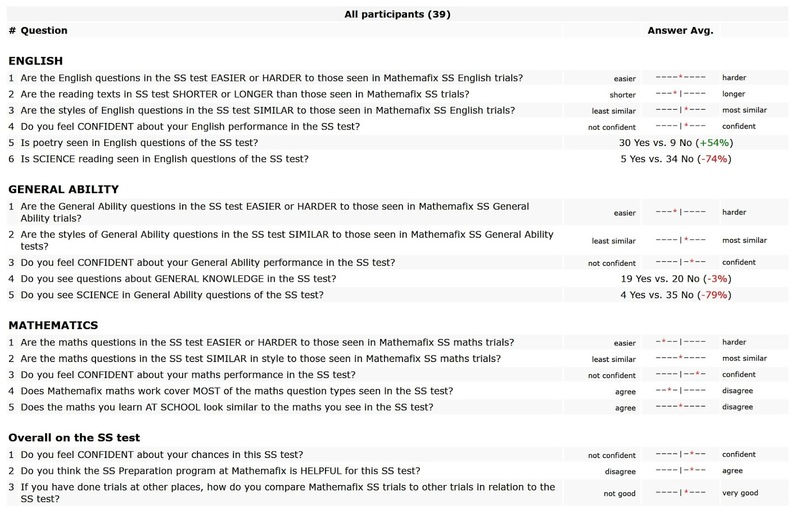 The survey of students doing the NSW 2018 selective test gives a good idea how effective Mathemafix is.